If you did something 400 times you would think you would be able to get it right at least once. Not always, as we learned after being called in to help a well-known company draft their corporate value proposition…after they had already attempted 400 versions unsuccessfully. True story. Outside of delivering consistent financial performance that meet expectations, creating an effective and impactful “Why Us” value proposition is the biggest challenge for most organizations. That 30 second blurb that explains to a prospect or customer who you are, what you do, and how you are different. Versioning – the good news is the company has a story. The bad news, there are many of them, none of them the same, and a new one is created for just about every new sales meeting. “Inward-out” – the story using internal jargon, it’s too long, reflects the company’s views, and not the needs of the customer or prospect. Non-differentiated – it focuses on the features of the product or services and not the benefits delivered to customers. As a result, it sounds just like everyone else in the market. “Same Page Syndrome” – this is the most fascinating of all. The folks responsible for putting together the story bring their own perspective on what the story should be. Using their own experiences, their role, and their history with the company, they all bring a different view on what the company does and why it’s unique. As a result, no one can get on the same page to describe the organization and its value…resulting in 400 rounds of edits and/or multiple versions. Given this situation, how to do you get it right? Go outside – start with doing external research looking at your target audience and industry competitors. 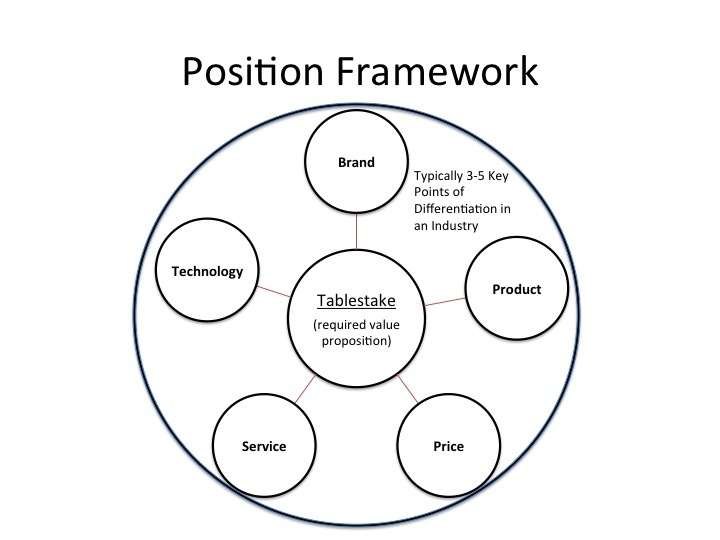 This will help you understand “tablestakes,” how to define value, and differentiate services. It should also help eliminate the “internal speak.” See below. Operational Excellence—This value proposition type guides companies to provide products at the best price or greatest convenience. Operationally excellent companies construct a value statement that emphasizes low prices and hassle-free service. Product Leadership —This value proposition type encapsulates companies that offer consistently innovative products that push performance boundaries. Companies defined by product leadership communicate their commitment to provide customers with the best product or service. Customer Intimacy—This value proposition type directs companies to cultivate long-term relationships with members of their target audience. Customer-intimate companies specialize in satisfying the unique needs of individual customers and provide them with the best total solution. 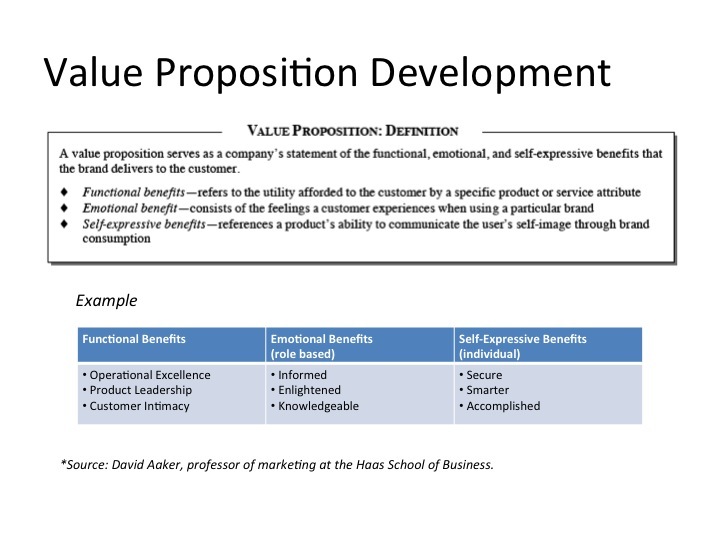 Make it personal and relevant – David Akers, a marketing professor at the Haas School of Business, defines a value proposition in three parts: Functional benefits, Emotional Benefits, and Self-Expressive Benefits. The functional benefits are related to the step above. Emotional benefits are typically tied the role, and self-expressive benefits to the individual. See below. Lastly, be disciplined – once defined, stick to it for at least a year. Marketing’s role is to clearly communicate the value (organization, product, etc.) to targeted audiences, sales is to convert it into revenue. As a result, sales may take some liberties with the story. But keep in mind, just because someone comes up with a clever new “Why Us Today” story in the heat of a pitch, doesn’t mean you change your messaging. Stay on point, you don’t want to do this 400 times…trust me. Original post date May 2010, the post was recognized as one of the best post on Social Media for 2010. As with most new technologies, social media is starting to “settle in” and common applications of the platforms are becoming known. In many large B2B organizations, that means social media is finding a home in the marketing communications group, often landing in PR. That seems fine for B2C organizations; however, I’m not convinced that it’s the right spot, and/or the only spot for social media in B2B companies. 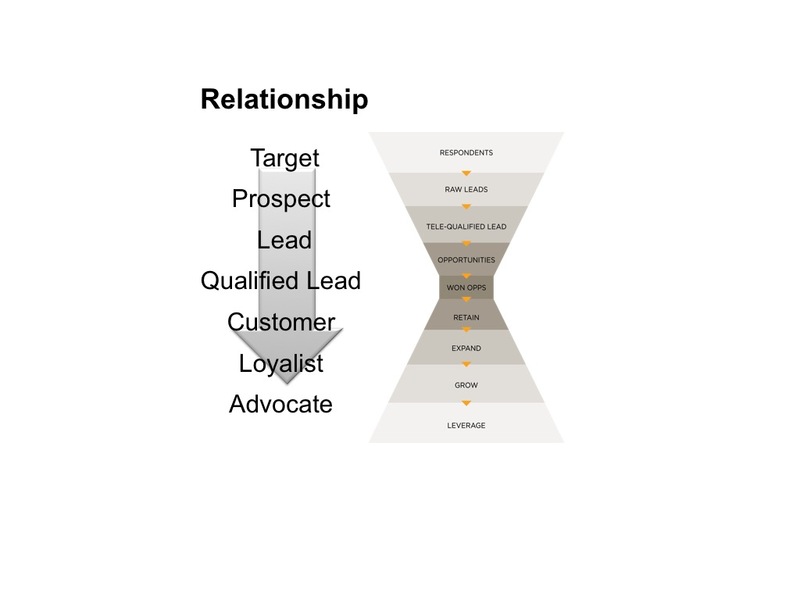 In most B2B organizations corporate marketing’s role is related to driving “top-of-the-funnel” activities. From advertising, PR, and now social media, the focus is on creating awareness…and hopefully, driving consideration and preference. There is another opportunity that may not be considered, a part of the funnel where marketing, in particular social media, can play a valuable role. It’s at the very bottom of what I’ll refer to as the “upside down” funnel. To find such an opportunity you have to think about a funnel that starts with once a prospect becomes a customer. 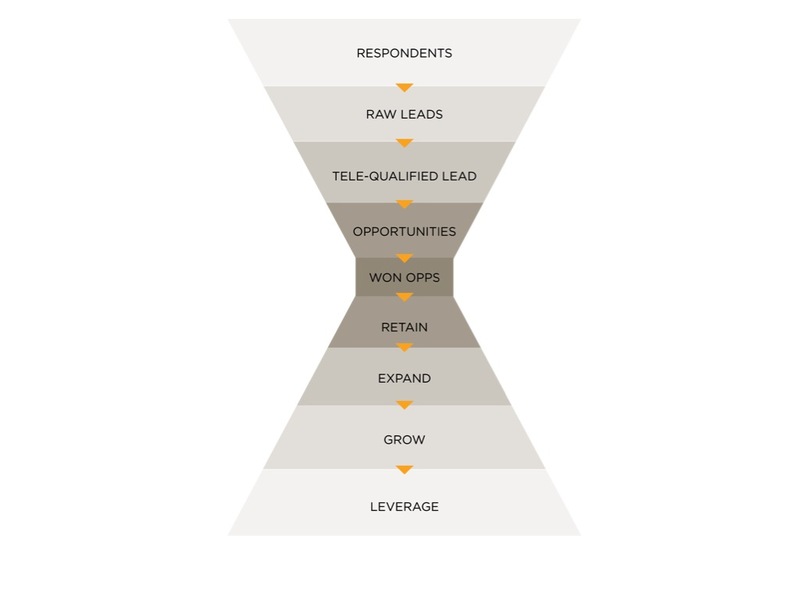 Just as a sales funnel has stages so does the customer relationship management process. Companies should be actively pursuing strategies and tactics to retain, expand, grow and then leverage customer accounts to win business. 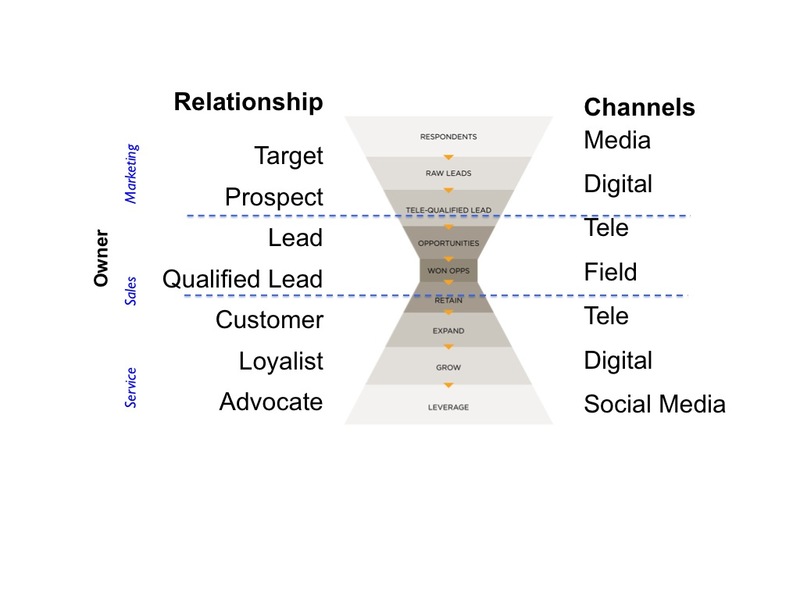 This is where I think the “sweetspot” is for social media in B2B. Here’s why: social media is about “consumers selling to consumers”, or “professional-to-professional.” If a company does its job of nurturing and retaining customers, it should be able to transition from having a relatively unknown prospect, to a known customer, to hopefully, a well-understood customer advocate…at least that’s the goal. If a company enables those customer advocates with social media it gives them a platform to spread the good word. The potential of this opportunity is huge, and for the most part, being missed at most companies today. As we all know, word of mouth is the most effective marketing there is, enabling it with technology creates scale, and the ability to track it. To do this successfully, companies have to first identify this opportunity within their organization; second, they have to change their current way of thinking about social media beyond its present use in marcomm and PR. The goal is to find ways to emotional connect avid customers to the company and/or products, and then provide them with an outlet to communicate that passion. As relationships deepen, customers begin interacting in more personal channels. Through those interactions they are likely to share more intimate details about themselves, and their relationship with products/services and the company. Companies have to be able to collect this information across channels to create a complete profile of a customer. If this can be achieved, an organization will have everything it needs to begin enabling, influencing and studying customer advocates. Finally, watch out for the “silo” effect. Typically, at least three different organizations will be interacting with the customer as the relationship develops. But it’s only one customer interfacing with what the customer expects to be one company. The organization has to be “in sync” because the last thing a company wants is to provide a customer with a platform for communicating the wrong message. Turning an advocate into an adversary is not the goal. Last month I had the chance to be a panelist at a forum hosted by Wolfgang Jank and the Robert H. Smith School of Business at the University of Maryland. The topic was on Informatics – Data Driven Decision Making in Marketing. Agreeing to participate without knowing what I would discuss, I searched my files reviewing old project work. Not only did I find a relevant effort, I also realized that I had spent two years working on building and implementing an insights program at a major Financial Services firm. What’s interesting about the topic is that everyone will agree that they should be more data driven, or fact based, with their decision-making. Heads will nod when it’s discussed, it’s intuitive, and so the question…and the problem, is why doesn’t it happen? The first issue we probably spent a good six months on defining what an ‘insight” was, how to create it, and who was responsible for doing it. The second issue was more complicated, and took much longer to resolve. Over that two-year period, I learned how challenging it is for an organization to use one source of data effectively across the enterprise. Some of the challenges we uncovered were typical such as lack of resources, process, and funding. Others were more challenging: People funded their own resources and research to support their strategy, budget or group. 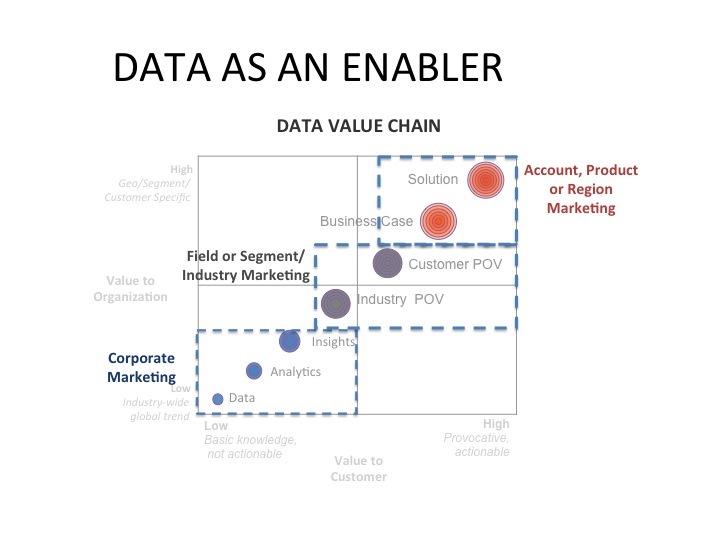 To begin to solve this complex problem we created a “data value chain” (see below). The starting point was having one centralized source for data. As we discovered, as data flows from across the organization to the customer, enhancements were needed to make it more valuable, like growth rings on a tree. 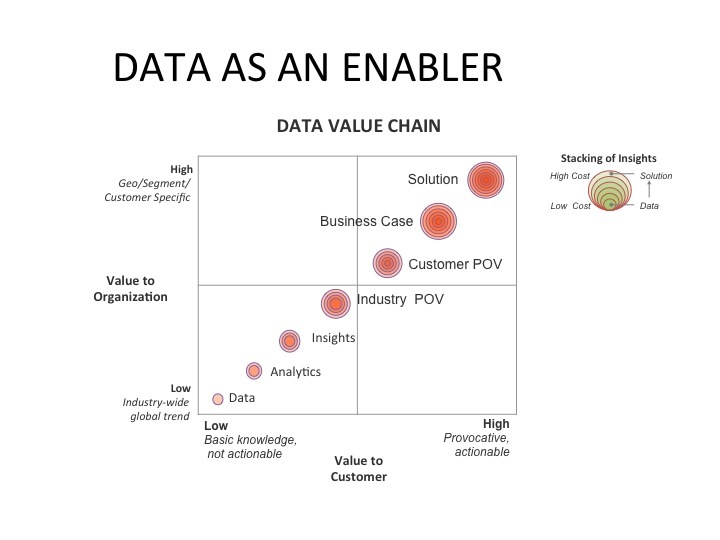 As data became more customized, and localized, it grew more valuable. This helped to identify why, for example, research that was being produced at corporate was not often used by the sales teams…it lacked relevancy, especially in regions outside of the US. Once we got everyone on the same page the next challenge was to align the various groups in the organization across the value chain. We learned there could be as many as five different groups involved in handoffs as the data moved across the value chain. This help to explain why product groups were developing solutions without market insights, and regions were not leveraging corporate insights for business development. As a result, we had to design process maps, hand-off points, engagement process, etc. The elephant in the room, and one of the biggest challenges was wrestling with the budget. The solution for that last huddle was turned out to be pretty simple. The answer was getting the data closer to revenue or a sale….”turning data into dollars.” The epiphany wasn’t that the value was found at the end of the chain but the number of groups, and the coordination needed to be involved to reach that destination.